In the last week we have welcomed four Franciscans and a Jesuit to our house. The Franciscans are the delightful Franciscan Sisters of the Renewal who came from their convent in Leeds to stay in our guest house for their annual retreat. Their retreat master, who lived with us in the monastery, was Fr Simon Bishop SJ, one of the chaplains to the University of Oxford. 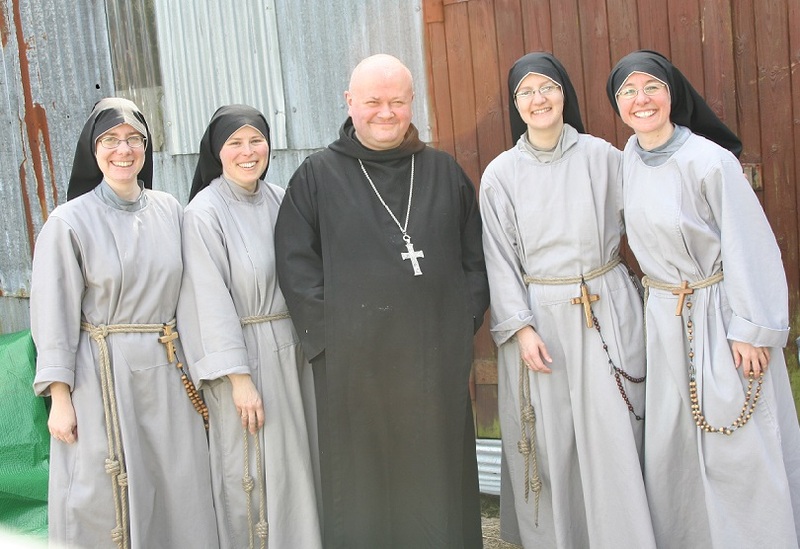 The photograph of the sisters is taken in front of the barn where the new lambs are. The sisters were quite taken with the lambs, as were the lambs with the sisters. Making these new friends was a great blessing. Benedictines gave hospitality to St Francis himself, and St Ignatius left his sword at our Abbey of Montserrat, so we are happy to welcome their sons and daughters. 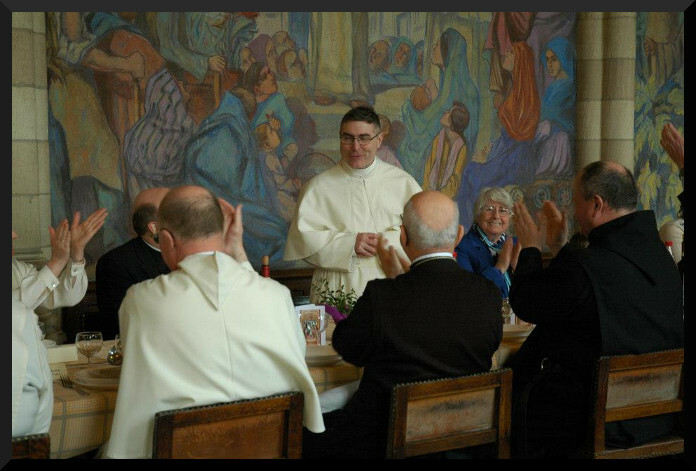 And – we have to admit it – the Jesuit was a great cook! 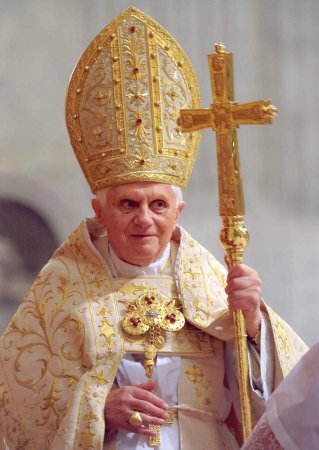 Our warmest greetings go to His Holiness, Pope Emeritus Benedict on the occasion of his 86th birthday. We commend him to the prayers of all our readers. Also, on this feast of St Magnus of Orkney, we commend to your prayers the soul of our own Dom Magnus who died in November of last year. We were very pleased to have Peter Stevens, the assistant organist at Westminster Cathedral, with us for Vespers this evening. He took to the ivories for a Bach voluntary at the end of Vespers. 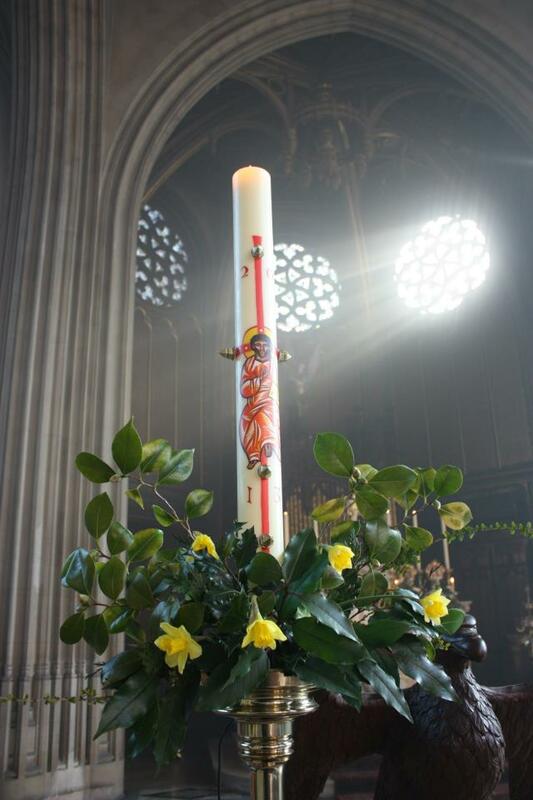 It is always a delight to have contact with the Cathedral and its music department, and we are glad to provide them with a rural grange from time to time. 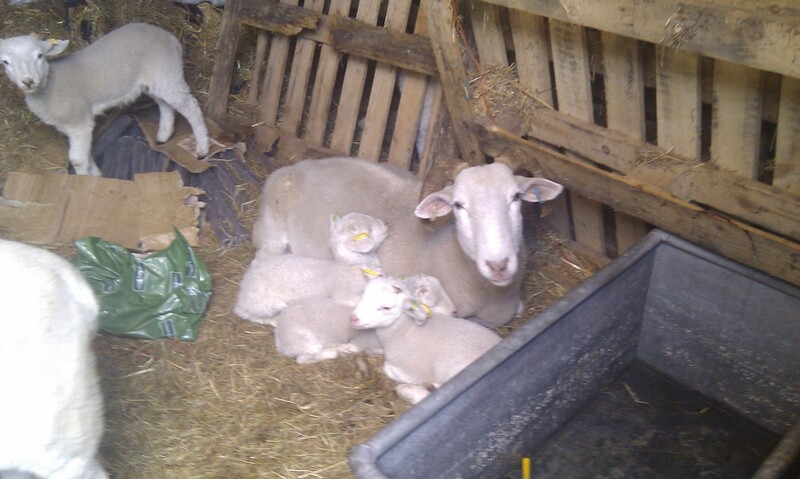 Because of problems with foxes and badgers, we keep our new lambs indoors until they are big and strong. We have twelve new healthy lambs at the time of writing. Our other trick is to keep the lights on at night and to leave the radio on. Radio Four is the best. It consists largely of conversation and runs at night into the World Service, so Mr Fox is fooled into thinking there are people in there. The downside is that the poor sheep have to put up with the dreadful Sunday Programme, with its inane religious coverage and deeply superficial coverage of Catholic topics. But, if the choice is Radio Four or death…well, it’s only for a few weeks! 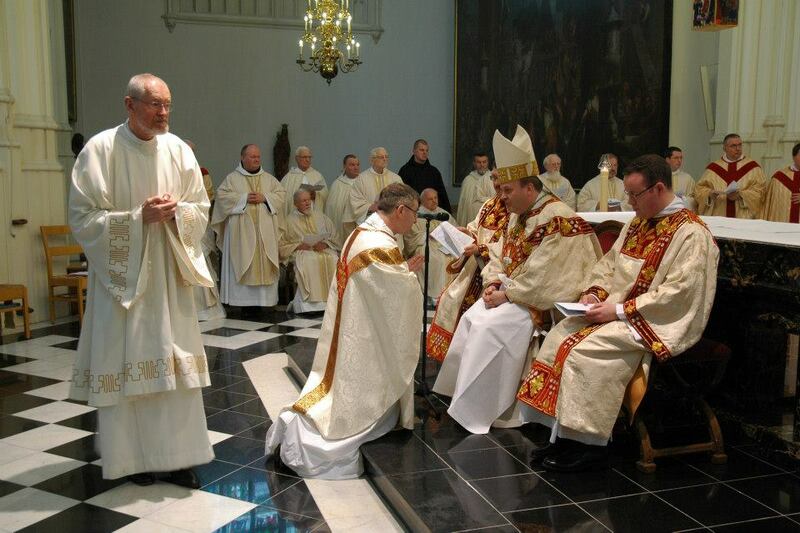 Fr Abbot and Brother Michael went to Belgium for the day to attend the ordination to the priesthood of Father Anselm Gribbin. Fr Anselm has been a friend of Fr Abbot since their student days, and has spent many happy visits at Farnborough across the years. The Abbey of Tongerlo has a very long and interesting history. 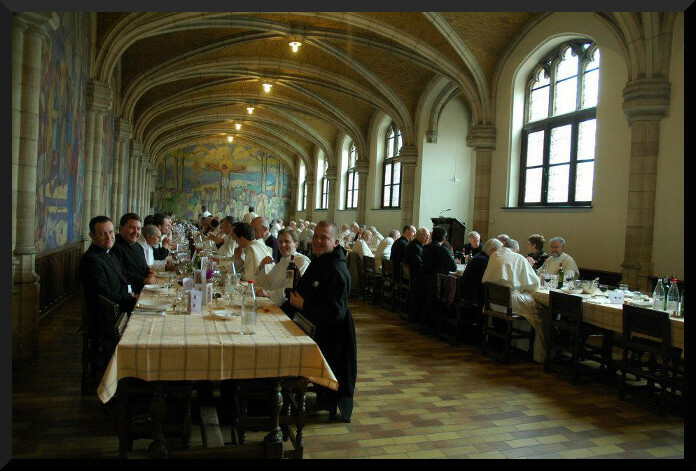 It belongs to the Premonstratensian Order, and we found the community to be extremely warm and welcoming. We were pleased to meet Father Anselm’s family for the first time, and to meet Brother Ninian, another member of the Tongerlo community, whom Fr Abbot has known for some years.  In recent years, the novice master of Tongerlo brought the young brethren to stay with us as part of their annual tour of ancient Premonstratensian sites. 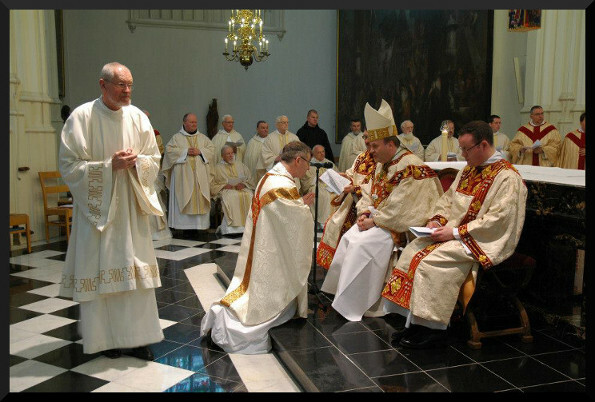 We pray that Fr Anselm will be richly blessed in his priestly life and ministry and that it will not be too long before we see him at Farnborough again.